Our firm hold immense expertise in the process of manufacturing and supplying a wide range of systems and doors and in this range we are availing Car Parking Management System. This system has been basically sourced from Elero Motors & Controls Pvt. Ltd. and is widely tested on various terms. 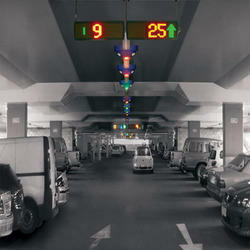 The system has been based up on the most advanced technology, it is preferred for managing the increasing traffic and non-availability of adequate parking spaces in busy and crowded areas.